Now through June 30, Horse Illustrated magazine and HorseChannel.com are giving away two pairs of tickets to the Destination Equus California Farm & Wine Tasting Tour, Sept. 7-9, in California’s beautiful Santa Ynez Valley. The tour offers a chance to go behind the scenes at world-class equestrian facilities. Tour stops include a visit to Flag is Up Farm, the home of Monty Roberts. Most recognize Monty Roberts from his autobiography The Man Who Listens to Horses, which is based on Monty’s original natural horsemanship concept that when horses understand that they can trust you, they will decide to be with you. (Roberts calls this moment “Join-Up,” in which a trainer negotiates with an untamed horse to form a voluntary relationship with him.) Interesting to note that this book came out in 1996, and long after an already-lengthy list of impressive highlights, including tracking the behaviors of wild horse bands and “learning the language of equus”; winning eight show-ring national championships in stock horse disciplines; taking hundreds of Thoroughbred racehorses to the winners circle in America, New Zealand, Germany and other parts of Europe; appearing as stunt doubles for Mickey Rooney, Roddy McDowall, Charleton Heston and Elizabeth Taylor; named “Stock Horse Man of the Year” by the National Reined Cow Horse Association; and demonstrated his natural horsemanship theories to Queen Elizabeth II at Windsor Castle for the purpose of training her equine staff. Yes, this all happened before his famous autobiography made the New York Times bestseller list for 58 weeks. And if it’s possible to trump his pre-autobiography schedule, he’s certainly done it. A BBC/PBS documentary entitled Monty Roberts: The Real Horse Whisperer aired. Monty published a second book, Shy Boy: The Horse That Came In From the Wild, which was followed by a second documentary based on the book. Join-Up went on tour, visiting more than 40 states and turning the equestrian world upside down. Over the course of his lifetime, Monty has recieved nine equitarian and humanitarian awards both within and outside the horse industry, including honorary doctorates in animal psychology from the University of Zurich and the University of Parma. He has published three more books in the last six years: From My Hands to Yours, Horse Sense for People, and The Horses in My Life. The Girl Scouts of America has even commissioned a special Join-Up badge and training program in honor of Monty’s pioneering work. And, behind every good man is a great woman. In 1956, Monty married Patricia (Pat) Burden, who is as loved as Monty in their personal and professional circles. Monty and Pat founded Flag is Up Farm in 1966 in Santa Ynez Valley. Their home overlooks the sprawling facility that contains round pens, arenas, pastures, barns and a sand track. Meet Monty and Pat on the California Farm & Wine Tasting Tour as they host breakfast in their private home and then take you on a private tour of Flag is Up Farm, where Shy Boy still enjoys his own exclusive pasture. For more about Monty Roberts, visit www.MontyRoberts.com. Please tell me that Shy Boy is not still housed, after one full yr. of this, in a single stall with uncut hooves. As a herd animal with no overhead shelter as well as no other animal in his pen, does this not demonstrate cruel care for such a herd animal? Is what the German lady on Common Justice.com said true???? I adore Monty Roberts. His work is fabulous. I hope to one day be as good a rider and horseman as he is. I would visit his website, there are a ton of good educational videos there- not like Parelli’s “buy this billion dollar stick to move your horse around, and it’s NOTHING like a crop, oh no, it has the Parelli namebrand on it!! !” Monty Roberts is much more down to earth! i love monty roberts! he is my hero, and when i am on my horse, i think about what he did and what he went through to get to where he is. it really amazes me to think of how he learned what he did. 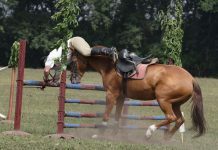 i have already tried some of his methods on my horses, and i saw their behavior improve dramaticly. thanks Monty!! !